Oranguru in game: 888 Who? Important notice! Pokemon Oranguru is a fictional character of humans. Oranguru (Japanese: ???—?? Yareyutan) is a dual-type Normal/Psychic Pokémon introduced in Generation VII. It is not known to evolve into or from any other Pokémon, but it is considered to be a counterpart of Passimian. 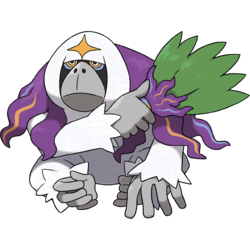 Oranguru is a large, white Pokémon resembling an orangutan. While most of its body is covered in white fur, its hands, feet, and snout are bare with its light gray skin visible. The fur around its head and under its chin is longer, and creates the impression of a long beard. It has a broad, flat nose and a black area around its eyes, which has light blue markings underneath, yellow sclerae, and white irises. In the center of its forehead is a yellow marking shaped like a four-pointed star. A cape of purple fur covers its back and is divided into many wavy clumps. There are a few strands of orange or light blue hairs in the clumps near the front. Oranguru holds a fan created from green leaves woven together with its own purple fur. This solitary Pokémon spends its time deep in the forest, meditating high up in the trees. While it is not normally active, it will provide food to hungry Pokémon and give medicine to injured ones. It has even been known to use human tools or items, including Poké Balls. This can make them difficult Pokémon for Trainers to handle. Ancient people actually thought Oranguru were people, and called them the "people of the forests." Known for its extreme intelligence, this Pokémon will look down on inexperienced Trainers, so it's best suited to veteran Trainers. Moves marked with a superscript game abbreviation can only be bred onto Oranguru in that game. Oranguru is based on an orangutan and a guru. It may also be based on the mythical satori, an ape-like yokai which could read human minds. 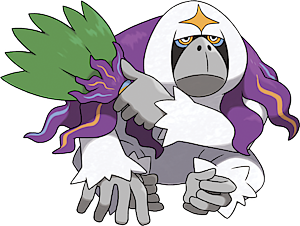 Oranguru may be a combination of orangutan and guru. Yareyutan may be a combination of ?? yare ("do it") and ????—?? oran'utan (orangutan).